Plot: Four lifelong friends have their lives forever changed after reading 50 Shades of Grey in their monthly book club. Starring: Diane Keaton, Jane Fonda, Candice Bergen, Mary Steenburgen. distributed by Paramount «Book Club» in the US movie theaters released on May 18, 2018 and has grossed over $67 million worldwide; dvd and blu-ray release date was set for August 28, 2018. Rent from Netflix and Redbox from August 28, 2018. 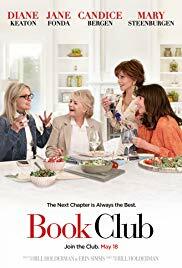 «Book Club» in the UK released in movie theaters on June 1, 2018. The movie released on dvd and blu-ray on October 8, 2018.